S-Square Systems | Scala 2.13.0-M5 is now available! Scala is a high-level programming language which is a combination of object-oriented programming and functional programming. It is highly scalable which is why it is called Scala. The name Scala is the abbreviation of the term Scalable Language. Martin Oder sky and his group created the language in 2003 to provide a high-performance, concurrent-ready environment for functional programming and object-oriented programming on the java virtual machine (JVM) platform. Scala is one of the new languages that is based on the Java Virtual Machine compatibility. It has a lot of similarities and differences as compared to the Java programming language. Scala is slowly finding a lot of acceptance among developers around the world due to its certain inherent strengths. One of the best resemblances of Scala to Java is that you can code Scala just the same way that you code Java. It is also possible to use a lot of the Java libraries within Scala along with many of the third-party libraries as well. Why Scala and where it is used? Why should I learn Scala Programming Language?” Let see why Scala is a beneficiary language to learn. 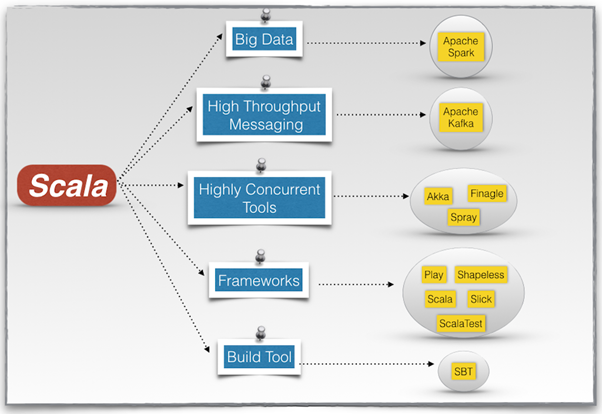 Scala is very versatile in the sense that it can be used for writing any type of applications like web application, desktop application, mobile application, enterprise application and so on. Requires lengthy codes to be written. Shorter codes for the same purpose. Rewriting is needed. Rewriting is not required. 88% of developers use Scala, 22% use python, and 44% use Java for Spark programming. With these growing numbers it can be claimed that Scala is one of the booming technologies in present scenario as major tech players are implementing it in their architecture. Despite struggling among the established languages like Java and Python, Scala has made its own niche delivering high-end productivity and performance over the years.